The Department of Cardiothoracic Surgery, started in 2000 by Dr K. Varadharaj, was established with a cardiothoracic intensive therapy unit and an operating room capable of performing openheart procedures for packages as low as 65,000 rupees. It has steadily progressed over the years to major vascular and thoracic procedures. Currently led by Dr P.R. 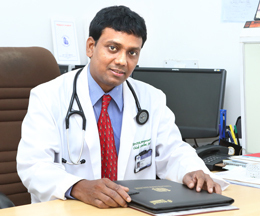 Murugesan, the department will soon be offering programmes for heart and lung transplantation. The department has achieved several milestones notable among them are contribution to many government initiatives, including the ongoing extended health scheme initiated by the state of Tamil Nadu. In October 2012, the CardioThoracic and Vascular Surgery (CTVS) team celebrated the landmark of completing 3,000 open-heart procedures at the institution. Over the years, the department has increased the number of surgical procedures it performs from 20 to 75 a month. Paediatric cardiac procedures for congenital heart diseases are performed successfully. For the fist time in South India, it has acquired a new heart-lung machine that uses Extra Corporeal Membrane Oxygenation (ECMO) to circulate blood through an artificial lung and back into the bloodstream. The CTVS team also assists in kidney transplant programme. The department performs diagnostic and therapeutic videoassisted thoracic surgeries. It is also renowned for performing procedures such as repair of the abnormal opening in the diaphragm, surgery to bypass diseased blood vessels, dorsal spine decompression surgery, insertion of intra-aortic balloon pump, and implantation of permanent pacemaker. As part of spreading health awareness, it educates the patients by circulating health education pamphlets on areas such as coronary artery bypass grafting, valve replacement, prevention of formation of blood clots in deep veins and the science behind anticoagulants. In the near future, the department aims to become a centre for heart-lung transplantation and minimally invasive cardiac surgery.